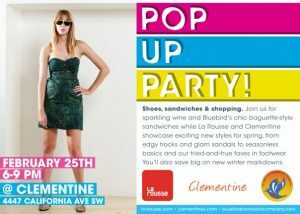 This Thursday, February 25th from 6 to 9 pm, join Clementine as they showcase new Spring sandal styles and edgy clothing by LaRousse. Sparkling wine and chic baguette-style sandwiches will be provided by Bluebird. What more could a girl ask for?! Well, nothing that we can think of!